I confess it, I enjoy Coyote and other Tricksters. Some might question holding up such rascals as folk heroes, but usually when they behave unacceptably, they get what they deserve. 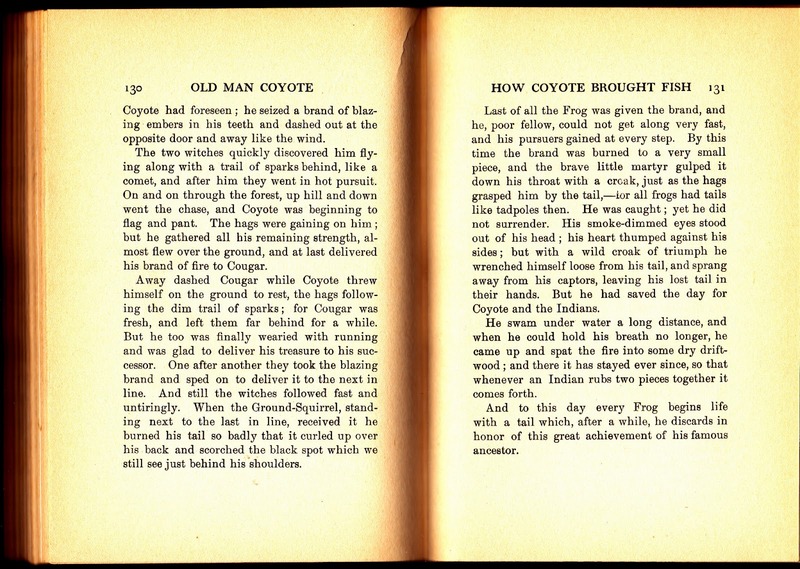 That's a worthwhile lesson to come from folktales and, with tricksters, it is usually done in an enjoyable way that doesn't feel like a sermon. 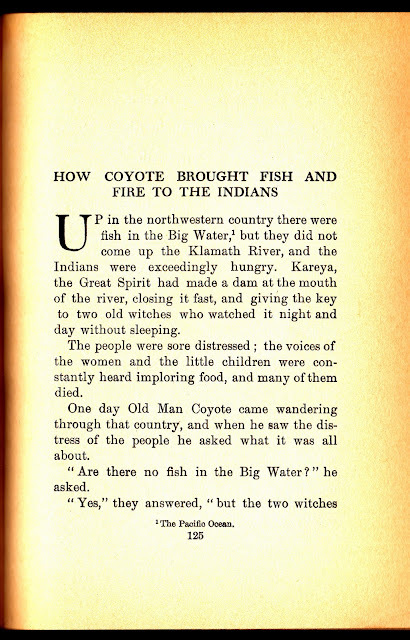 But Coyote, Raven, and others sometimes even surprise us by using their very trickiness to produce something good! Today's story is one of those. 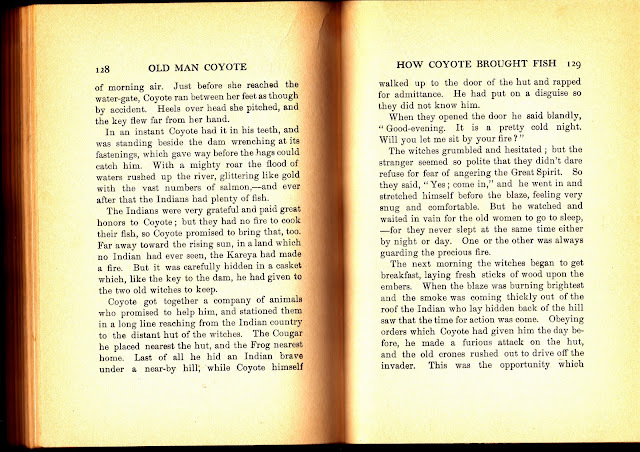 There are many Coyote tales in my library, but Old Man Coyote by Clara K. Bayliss is safely in the years of Public Domain while others are either individual tales within collections or are collections that my research shows no renewal. An interesting feature of Ms. Bayliss's versions is they often combine two tales into one story. This is true for today's offering. 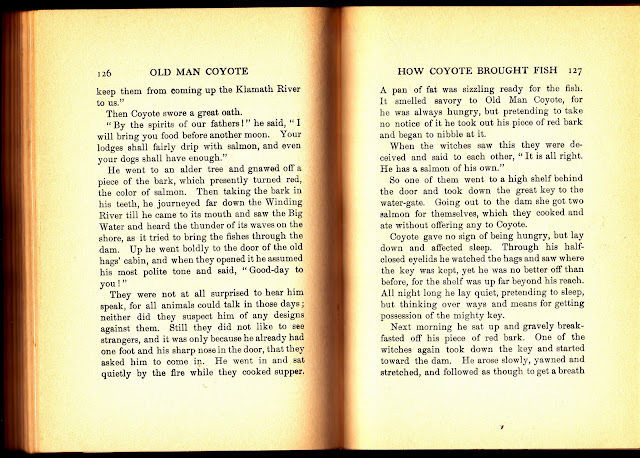 I also enjoy the bit of "pourquois" tale that comes in this version of the story. I was familiar with most of those explanations of why the various creatures were the way they were, but loved the added ones about Frog. For those wanting sources on the stories in Old Man Coyote, Ms. Bayliss cites sources like Curtin, Boas, Mathews, Teit, Bancroft, and the Journal of American Folk Lore, but she does not attempt to give specifics as to the origins of her retellings. 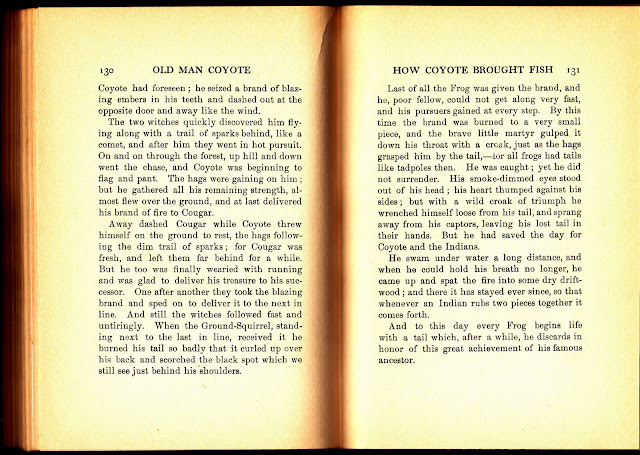 It's up to you if you are so caught up by Coyote that you must know more, or just enjoy a good story. Unfortunately this volume has not yet been preserved online. 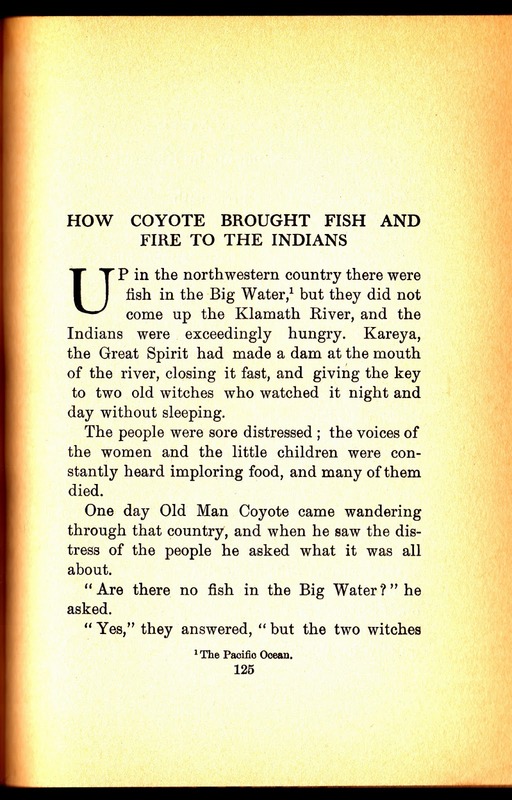 Her only work e-published so far is A Treasury of Eskimo Tales. Northwest native trickster, Raven, makes his appearance there.